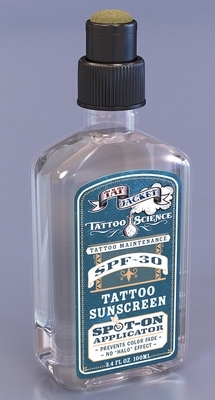 Tatjacket's Tattoo Science line of Tattoo Aftercare (tan label) and Tattoo Maintenance (blue label) is finally here! After 3 years of testing and planning, Tattoo Science hits the streets. This Broad-Spectrum SPF 30 sunscreen has our unique "Spot-On" applicator. This liquid sunscreen is applied evenly and smoothly exactly where you want it and not where you don't. Want to tan without fading or damaging your bright and vibrant tattoos. Won't leave a "Halo Effect" that you get when applying other sunscreen products. Our dab on applicator has a spring valve inside to prevent spills. Use this at the beach, at the tanning salon, or all day any day. 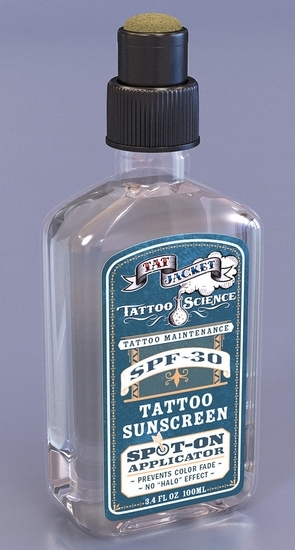 Tattoo Science Sunscreen is water resistant and lasts for hours. You pay a lot of money and endure a lot of pain to get your body art looking perfect. Well care for those tattoos and keep the lines sharp and the colors bright. Tattoo Science can help make that happen. This Broad-Spectrum Sunscren was designed with tattoos in mind. That's why we say "Where ancient art meets modern science". Use it in conjunction with all of our specially designed ongoing tattoo maintenance products. GET IT FOR YOURSELF OR GIVE AS A GREAT GIFT.